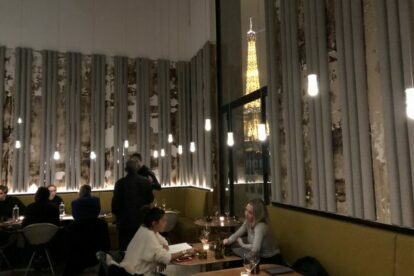 On the ground floor of the Palais de Tokio you can find this nice modern restaurant, very much a favourite with the expat and local intellectual community in Paris. It used to be a very young and bright space which now has been nicely renovated into a design space with traditional tables, but also some small cubicles for 4-6 persons that can make a nice spot for an intimate dinner. My suggestion is either to spend a morning at the museum of modern art, in the same building, and then eat at this trendy place, or go there after a walk by the river or near the Eiffel tower for a nice dinner. Beware, at night it gets full quite quickly so it is better to call for a booking. In summer, they also open the terrace from which you can see the river and enjoy the nice, sunny weather of Paris. They have Mediterranean cuisine lunch menus for 23 EUR at lunchtime Monday through Friday. A dinner a la carte might go for around 30 EUR. Cocktails 12 EUR.